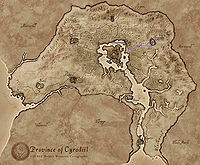 The Blue Road runs east to west between the Imperial City and Cheydinhal in the province of Cyrodiil. In the Second Era, a strategic keep was located on the Blue Road, between Cheydinhal and the Red Ring Road. This page was last modified on 15 December 2014, at 19:28.